Aikatsu! – 04 | Mezashite! Go break all your legs, Wota-kun! 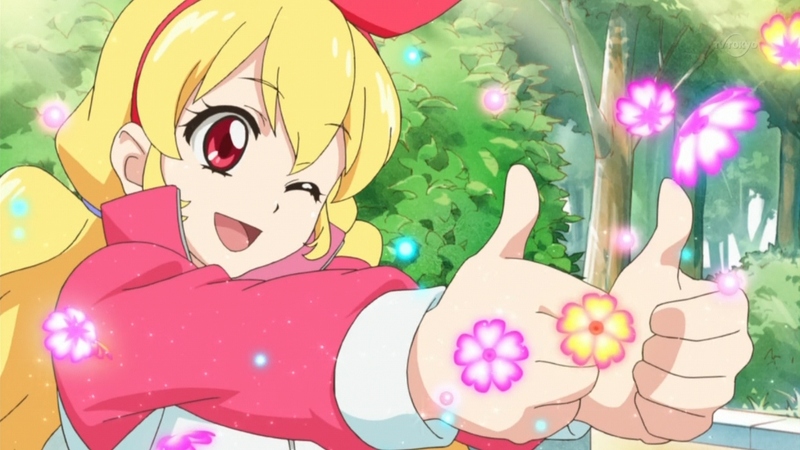 And now for the long awaited fourth episode of Aikatsu! As you could probably tell by the wonderful title of Oh! My! Fan!, this episode is all about Ichigo’s first fan. I guess they aren’t scared of introducing new male characters every episode; let’s just hope they stay as awesome as Raichi and Johnny Bepp. This week’s note: Takoyaki is a traditional Japanese food, otherwise known as “octopus balls”. Originating in Osaka, these balls of batter filled with bits of octopus are cooked in a special pan, and young people in Japan often have takoyaki parties where they make all sorts of creations, a lot not even including the vital ingredient of octopus. Also, it would be good if you put chapters, It’s not that important, but it’s good to have. Thanks for the subs I was watching it by streaming on anime44, but lately the updates there are taking forever, since I already have seem the previews episodes there, episode 4 was the 1st I actually downloaded here and I was like wow no more streaming for me you guys do a nice encoding and the subs are good. Thanks for being the only fansub translating it, I love idol animes mostly for the songs and moe aura of the bishoujos. I hope you keep up the great job. I have read the coments on the previous episodes so the torrent actually come out on tuesdays? We try to release on Monday, but due to whatever circumstances sometimes we’ll have to wait until Tuesday. Except for the first episode Tuesday will be the latest an episode will come out. Aikatsu! mezashite’s episode 4 resurfaced the night of 10/11/13. Was the episode revised, so is something else going on here?